It was the storybook ending for fifth-year University of British Columbia women’s field hockey captains Sarah Keglowitsch and Sophie Jones as the pair hoisted the McCrae Cup as the U SPORTS national champions for a record seventh straight time in the program’s history. A pair 2-0 victories over the York Lions, Nov. 3-4, sealed the best-of-three championship series in Vancouver and if that wasn’t enough both Keglowitsch and Jones pocketed a goal in the final, while Keglowitsch was named the Championship MVP. The Thunderbirds benefited from a penalty corner goal from Jones in the 33rd minute just before halftime. Jones executed a straight sweep shot, with a perfect lift, to find the backboard for the championship-winning goal. Keglowitsch showed her speed and skills in the 49th minute as she doubled the lead with some expert individual skills, burying a quick backhand shot in the far corner. 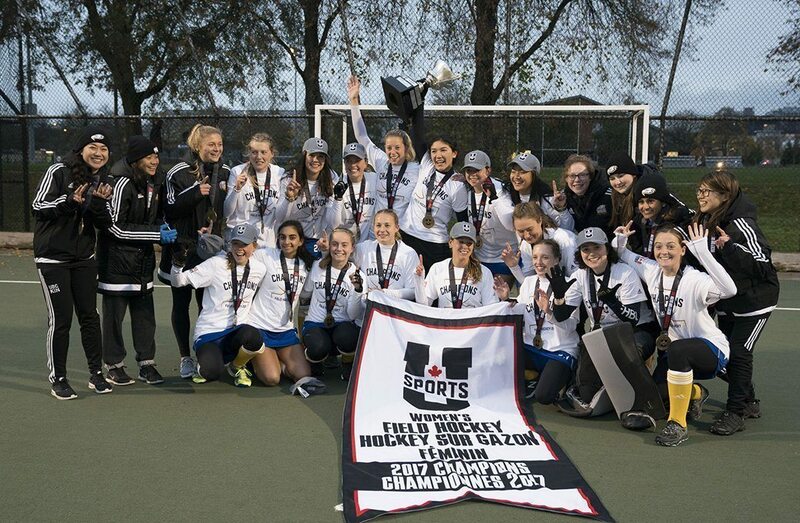 U SPORTS Player of the Year Rowan Harris picked up both shutouts in the championship, as the T-Birds bring their field hockey championship total to 19. Despite shutout losses in two games, it was still a historic season for the York Lions, who hit impressive records in their program’s history with an 11-1 regular season and an OUA championship banner and U SPORTS championship appearance. The future is bright for the Lions, who did not make it easy for UBC. 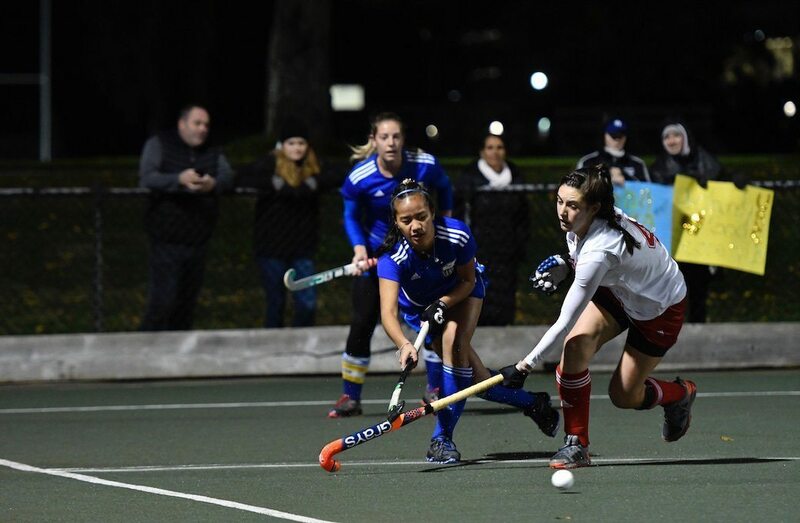 Fourth-year defender Sara Vollmerhausen and third-year Sydney McFaul anchored a gritty defence unit that held UBC mostly to the perimeter of the circle. Third-year midfielder Montana Merante was a work horse up front for York, forcing several UBC turnovers, while rookie midfielder Frankie St. Louis has a break-out performance, showcasing her skills through a notable 70-minute performance. The Lions will see the departure of just two fifth-year players from their 2017 championship roster as midfielder and captain Rebecca Titus and defender Cassidy Nicholls leave the Lions with the program’s seventh U SPORTS silver medal, while rookie Sterling will be a force to contend with over the coming years. For the Thunderbirds, it couldn’t get much better as alumni from decades of championship-winning teams lined the sidelines to cheer on their team to victory. Former Thunderbirds field hockey coach Hash Kanjee was immediately across the pitch to congratulate his former players, including Keglowitsch, who played her rookie season in Kanjee’s last year at the helm that ended with nine U SPORTS and 14 Canada West banners. The Thunderbirds had to work hard for their 2-0 win as the Lions were challenging in both ends of the field. Although UBC maintained the majority of the possession, their attacking opportunities were limited. Nicholls and York teammate Laura Touhey defended the flanks well as they were tasked with guarding the talents of UBC midfielders Jordyn Faiczak and Margaret Pham. With everything on the line, York’s desperation paid off with several dangerous attacks but UBC’s Hannah Eborall was outstanding defensively. Eborall chased down a streaking Stirling in the circle to deny a tying opportunity in the opening half, while all through the second half the second-year defender was tackling York forwards in and around the circle. The Thunderbirds’ attack came in waves as their speedy passing through midfield continually opened up the field. Keglowitsch’s skills in the center of the pitch, quietly maintained the tempo of the game, continuing to feed balls to the speedy Abbey MacLellan and Thora Rae up front. Stirling did cause havoc late in the game, earning the Lions their first and only penalty corner late in the second half after her backhand attempt hit the foot of a Thunderbird in the circle. The resulting set piece was swept out to Stirling but the bouncing injection slowed the play down. UBC netminder Harris was easily away to clear the shot away with her kicker. 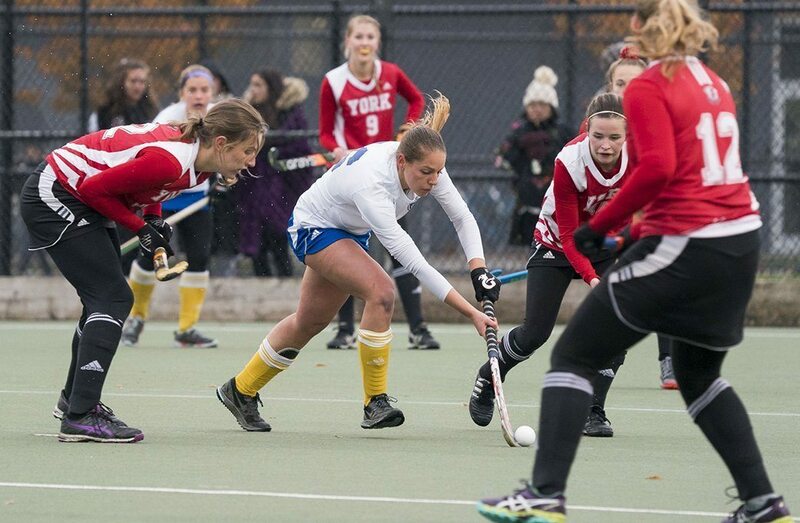 Goals from Keglowitsch and Jones were enough to propel the T-Birds to their seventh straight U SPORTS title and close the chapter to an outstanding five-year career for UBC seniors Meghan Hayden, Keglowitsch and Jones. “This was a really special one for them,” said Robin D’Abreo, head coach of the Thunderbirds, , who now has four straight national titles to his name. “We haven’t hosted a championship series for a long, long time. None of them have ever been a part of it at home so to do it with a good performance in front of family and friends who have been supporting them not just this year but their entire careers was really special. I know the score line was 2-0 but they are that style of team. They are always one simple counter-attack away from tying the game. We were on edge the entire 70 minutes of both games because they are such a threat on the counter. 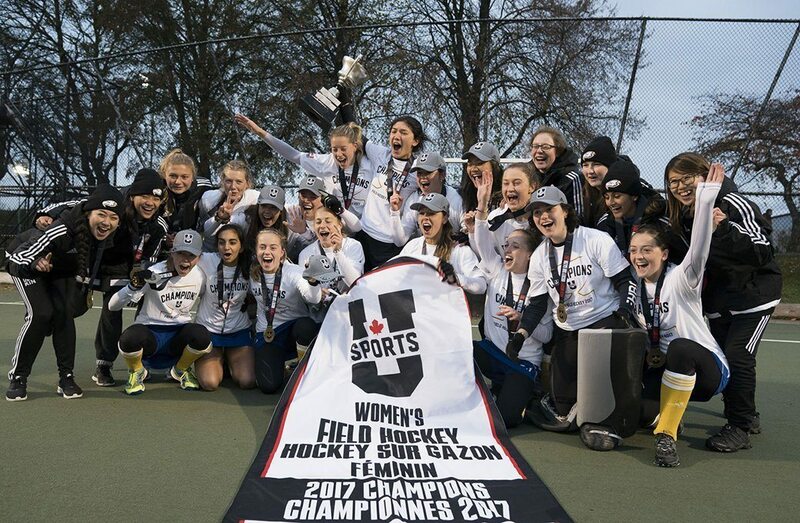 The Thunderbirds finished the 2017 U SPORTS best-of-three championship taking the first two games with 2-0 victories from four different goal scorers, ultimately hoisting the McCrae Cup for the seventh time in a row and 19th overall in what continues to be a historic women’s field hockey championship run.